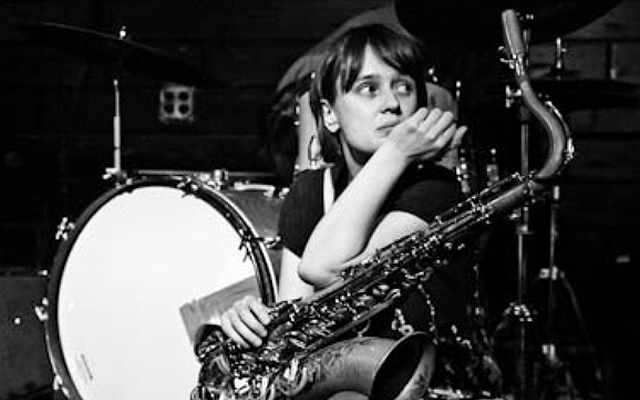 This most ambitious work Contemporary Chaos Practices – Two Works for Orcestra with Soloists by the tenor saxophonist Ingrid Laubrock comprises raw and visceral music and often sounds as if it has sprung into being from a point before and beyond the modern world. And the music, as if a contrapuntal function of its title evokes elemental human and natural forces, such as the elemental cycles of the natural world or the destructive march of time itself. Its architecture seems to possess the massive rough-hewn quality of natural monuments and yet – as here – even as her career has progressed from its early days of experimentation in Germany Miss Laubrock has shown an increasing ability to produce music of spare lyrical beauty and, on this occasion, even haunting delicacy. Miss Laubrock’s sombre, sometimes melancholy and always profound works – especially the long, four-part tone poem “Contemporary Chaos Practices” seems to hint at some sort of geographical metaphor – powerfully muted for most of its length, but rising at its centre to a vast and shattering climax – as she divides the orchestra into several layers or “strata” whose shifting relationships seem to evoke the massive natural forces that shape our planet. Sometimes the strata stack up immensely; at other moments they thin to the most diaphanous textures with vocalists and strings woven into the sound mass, but always there is the sense of returning to the same point – the jagged musical topography of “chaos” – only to discover that the musical perspective has changed in the interim. 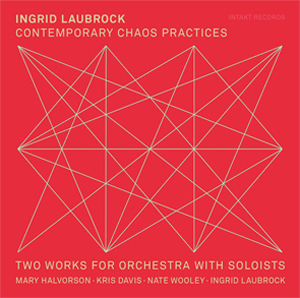 On top of these seismic musical processes, Miss Laubrock creates a virtuoso orchestral superstructure whose riotous details suggest the teeming “chaotic” surface life of Earth in all its protean variety. The aristocratic orchestra – conducted separately by Eric Wubbels (“Contemporary Chaos Perspectives”) and Taylor Ho Bynum (“Vogelfrei”) tussles mightily with the Germanic heft of perhaps Miss Laubrock’s grandest structures. The jagged, but never random, shape of this monumental work is guided by its soloists – Mary Halvorson on guitar, Nate Wooley on trumpet, Kris Davis on piano and of course Miss Laubrock on soprano and tenor saxophones. Theirs are phenomenal efforts that draw bright light from the work’s heliocentric source, which is then reflected from the myriad nooks and crannies of the overall structure producing gem-like detail to this fascinating work and carries the listener to a point where the score’s fathomless riches are revealed in all their glory.